De La Warr Pavillion, originally uploaded by Edwyn UK. They told us the weather would be awful but just look at that blue sky. The perfect time to head to the coast is when everyone thinks the weather will be horrid and therefore literally leaves the coast clear for the rest of us crowd shy folk to enjoy ourselves. So via a visit to newly moved friends we managed to squeeze in a trip to the glorious De La Warr Pavillion in the oh so English seaside town Bexhill-on-Sea. We arrived fairly late in the afternoon, so agreed to save the ice cream until after we’d seen the exhibition Seascape by Susan Collins. Oh dear, we got out at 5.10pm, and the seafront refreshments had all shut up shop. I was transported back to my childhood in Lincolnshire where everything stopped at 5 and by rights you should be sat at the dinner table eating your tea, as we called it. And I imagined that that was exactly what was happening in every household in Bexhill right there and then, via the fish and chip shop which was experiencing the most activity in the near vicinity! 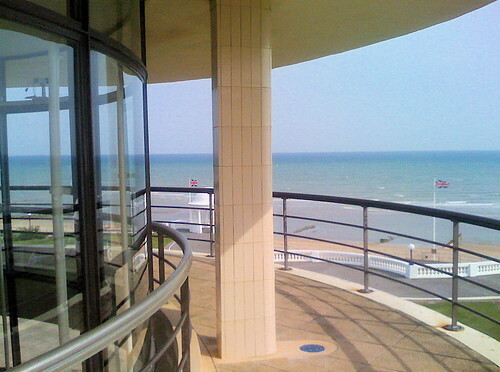 So, visit Bexhill and the Pavillion, but make sure you get your ice cream before 5!